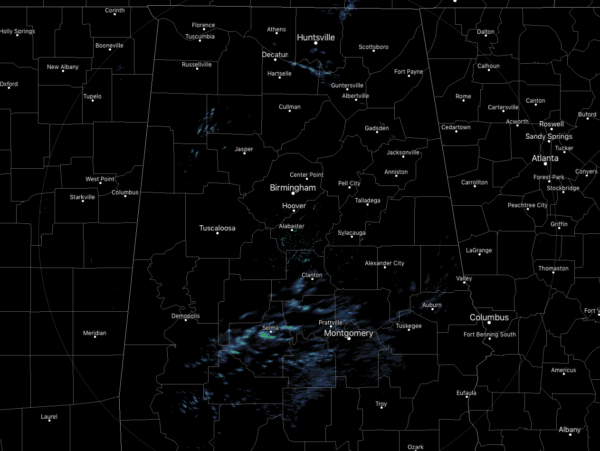 Skies are mainly cloudy across Central Alabama halfway through the midday hour, as there are a few small breaks letting a minute amount of sunshine through. 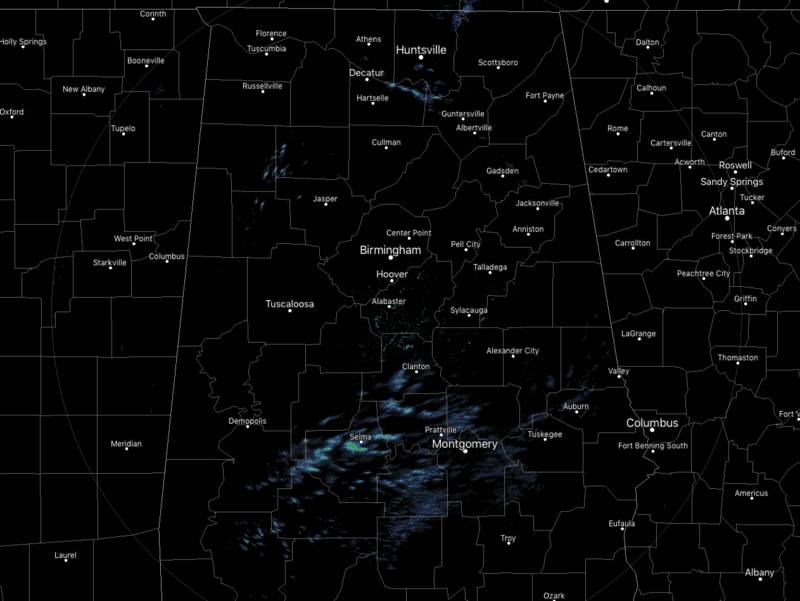 There are a few light returns mainly across the southern portions of the area. There are a few spits of showers over the northwestern parts of the area as well. All of these are pushing off to the northeast. We are still seeing some of the effects of the wedge over the northeastern parts of the area as temperatures are in the upper 40s to the mid-60s across the area from northeast to southwest. The cool spot is Gadsden at 48 degrees while the warm spot is Demopolis at 64 degrees. Birmingham was at 57 degrees. The effects of the wedge continues to lessen over the northeastern parts of the area and temperatures will finally begin to warm. We’ll continue to have a small chance of light showers throughout the early afternoon hours, but shower chances will be on the increase as a weak boundary will be working northward up from the Gulf of Mexico. The good news is that any showers that form with this boundary will be light in nature as well. Those higher chances will be in the locations between the I-59 and I-85 corridors. Skies will be cloudy and afternoon highs will top out in the lower 60s to the upper 60s across the area from northeast to the southwest. For tonight, we’ll continue to have some scattered light showers across the area, but a squall line out ahead of a cold front will be heading in our direction and should start moving into the area by 3:00 am. Overnight lows will be in the mid-50s to the lower 60s across the area from northeast to southwest. The good news is that the Storm Prediction Center has removed the Marginal Risk for severe storms for Tuesday as the ingredients will not be coming together for severe storms. While a squall line of showers and maybe a few embedded thunderstorms will still move through the area during the first half of the day, the instability will be too low and mix that with saturated air, severe weather will be unlikely. There will be some strong shear in the early morning, but that will be decreasing throughout the morning hours. More good news is that the rain will be out of the area by the mid-afternoon hours and skies will begin to clear. Winds will be gusty at times throughout the day, averaging 10-15 MPH out of the southwest to the northwest with gusts as high as 25 MPH. Highs will take place early in the lower 60s to the lower 70s but will be falling throughout the afternoon hours. By sunset, those temperatures will be down in the upper 40s to the mid-50 across the area from northwest to southeast, and lows will be in the 30s. 1899 – Perhaps the greatest of all arctic outbreaks commenced on this date. The temperature plunged to 61 degrees below zero in Montana. At the same time, a “Great Eastern Blizzard” left a blanket of snow from Georgia to New Hampshire. The state of Virginia took the brunt of the storm, with snowfall totals averaging 30 to 40 inches.